According to the 24/7 Family History Circle it's Family History Month, and they're going to post 5 questions each week on a weekly topic. They'll provide 5 default questions, but one can make up their own. There's also a good article on how to get beyond the fear of the blank page. The five questions for the first week are on the topic: "School Memories" and since my 20th high school reunion was this past weekend, they seem very appropriate. I thought I'd post my answers. There's no question my favorite subject was English. (Well, second to Lunch) Ever since my first grade teacher challenged the class to read as many books as we possibly could in one year. She insisted we weren't competing against anyone but ourselves, but somehow I learned that a girl who lived across the street had set the 'all time record' a few years before. She no longer had it at the end of the year, and I haven't stopped reading. (Though my pace has slowed down a little.) The school was closed, and the teacher retired, four years later, so my record will stand forever on a technicality. CrossX Debate, Original Oratory, Student Newspaper, and the Student Teacher Organization to Prevent (STOP) Nuclear War. In Junior High School there was a field trip to Nauvoo, IL, which is a 3 hour drive from St. Louis. I went to a public school, so this wasn't meant as religious instruction. However, we did learn about the history of Nauvoo, and Joseph Smith. A tourguide at Nauvoo gave everyone a copy of the Book of Mormon to take home, but I don't believe I ever read it. I think if the school did this today, there'd probably be complaints, but I didn't feel at all preached to. It was presented as a field trip where we could learn the history of a nearby town. I'd have to say my first grade teacher, Mrs. Jones, - with that reading challenge. I almost always bought a lunch at school. I always looked forward to pizza. There's a message hidden in the five names below from various census. The message reveals what my plans for this weekend include. Family lore had my great-great-grandmother's maiden name as Rose Garten. I always cringed and shook my head, wondering if that could be true. Everyone knows there are real Rose Gartens out there, and other silly names, but still, I didn't want my ancestor to have to have suffered through that. When I discovered her death certificate, and with her son, my great-grandfather, as informant, learned her name had been Sundberg, I smiled in relief. Another son's birth certificate just arrived from London, and as she was the informant in this case. that narrows down any variances to clerical error, which is usually limited to spelling. Turns our her maiden name was Sandgart. A nice compromise between Sundberg and Garten. Unfortunately, there are no records on Ancestry or FamilySearch of anyone ever having that surname. Anywhere. Anywhen. I plugged the word into Google, and it was a 1-word Googlewhack. Sure, if I spell it Sandgaard, or Sundgart, I come up with some peeps from Denmark or Sweden, but somehow she had to meet her husband in Warsaw. I ask myself...Did the Danes ever invade Poland? Turns out, not to my knowledge, but there was a series of wars between Denmark, Sweden, Poland and Russia . Hmmmmm. I wasn't satisfied that the On Notice board I created was sufficient fun in response to the challenge issued on CowHampshire. So I went to the Hobbit Name generator, and entered in my own name, and the names of all my ancestors up to 4 generations, and then of course I created a new database on iFamily and typed in those names. I fear I may need to apologize to my Mom most for the results. If anyone is interested in the gedcom, just ask. I entered nothing except names, though I could have created some descriptions a the detailed character generator. I do notice in the final generation that there is evidence of possible pedigree collapse if I carry the diagram much further. And why did Drogo Foxburr of Fairdowns change his name to Hardbottle upon coming to America? You'd have to ask him. Janice at CowHampshire wants genealogy bloggers to show we can be funny. So I decided to come up with a list of people and things to put On Notice. 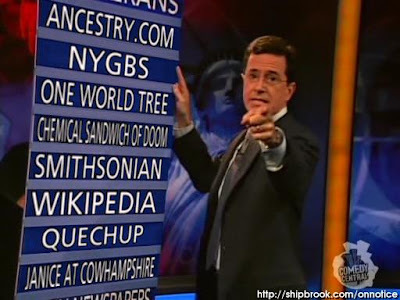 If you're a Colbert fan, the URL to go to for this generator is on the image. London – Sept 14 English indignation against France was strengthened today on account of the observance by all Jews of the Day of Atonement. The day was celebrated here, especially in the East End, with Dreyfus demonstrations…The Great Synagogue in London presented a striking spectacle. It was crowded from 6 o’clock in the morning until 6 at night and thousands were unable to enter. Several of my Newmark ancestors were likely at the Great Synagogue that day. They were in London from 1893 to 1909. They were definitely at the Synagogue a couple years later, on August 31, 1902, but that’s a different post I will write soon. HARP, the Historical Appellate Review Project, is dedicated to setting the record straight. Using state-of-the-art genealogical and legal research procedures, HARP will investigate your family's alleged black sheep and let you know if their names might be cleared! In certain cases, we even may be able to go to court and get the official record changed! That sounds like a great idea! I haven't found any ancestors yet that have been convicted of any serious crimes, but if I do, and think it may have been an unfair conviction, I now have a place to go! 1) Were any of my ancestors pirates? 2) Did any of my ancestors own parrots? 3) Did any of my ancestors like to drink rum? 4) Do I have any distant cousins who have played baseball in Pittsburgh? Realizing I am unable to say 'yes' in certainty to any of these questions, I am a little glum on Talk Like a Pirate Day. I found a free Mac download that will export a Register-format report from a Gedcom file. It's caled Personal Ancestry Writer II. It combines most of the features of the LDS Personal Ancestral File program (PAF) for the Macintosh (for which all development stopped a few years ago after release 2.3.1), with additional features that generate web pages (in HTML), word processing files (in RTF for, e.g., AppleWorks) and desktop publishing files (in MML for FrameMaker). The generated report files include genealogical dictionaries, registers, ahnentafels and lineages—such as appear on this site—as well as some interesting text files and pedigree charts. It tries to do a lot of things, and could be used possibly as one's primary software, though its interface looks like it was created in the dark ages of System 7 and never updated. Still, it is free. PAWriter is not meant to have the bells and whistles that are in the current crop of genealogical programs. The emphasis is on maintaining a genealogical database from which the user can write books and/or post web pages about a family. Users of MacFamilyTree or iFamily who feel they must have a Register report can use it easily for that purpose. I thought I would download the iFamily demo to try out a different genealogy software package. The website says it integrates well with iPhoto which is intriguing. It's a ten-day trial, and I will look at it some more tomorrow, but one of the first things I noticed was that they included an interesting sample GEDCOM with the package. The Royal family. Being familiar with Shakespeare and all, I did suspect Harry's first name was Henry, but there may be a character limit issue with the software, as the prince should have four names "Henry Charles Albert David," and his record only includes the first three. I was a little disturbed that while it does mention that the Queen Mother passed away in 2002, it has Diana Spencer as living. I also noticed that while the Romanovs are included in the name index, Vlad's family isn't, even though it has been recently claimed that Charles is descended from a brother of Dracula. I guess asking for completeness in the sample GEDCOM is being a little too nitpicky. Note: I live in the US, and so this post is US-centered. Different laws apply in different countries. The recent discussions on copyright, due to their origin, have mostly focused on "fair use" and technology's impact on copyright law. But if a work is in the public domain, it is free to be used in any way anyone likes, without the need to get anyone's permission. In genealogy we read source material of various age, and the issue of public domain can arise. There is some confusion though about what is in the public domain, due partially to recent court decisions revising the code, and partially due to different laws being in effect depending upon when a work was written, and where. I don't work somewhere that understanding copyright law is part of the job description, but a colleague a couple days ago told me he was certain that it no longer mattered when the author died, it was a flat 95 years after creation. This is wrong, but it is understandable why they might think this. There has been a lot of media about corporate copyright, and work-for-hire now lasts for 95 years. Another colleague in the discussion claimed that Disney is actually trying to argue that some of their characters were created by Walt Disney, and not by the company, so that the clock starts when Disney died in 1966. I haven't verified this, but it sounds like a smart business move, for if they are successful, Mickey Mouse won't be public domain until after 2036 (1966+70), instead of 2022 (1928+95). Yielding an extra 14 years of profit. The Intellectual Property Officer at Cornell University creates an annual chart detailing what is in the public domain as of January 1st of the current year. It depends on factors such as whether the work was published, or unpublished, with notice or without, where, and when. But the chart does a great job in my opinion of simplifying it as much as it can be simplified, and still cover all contingencies. Note: all my comments regarding length of copyright terms in this post come after reviewing the chart linked above. It's been 12 years since I had any formalized training on copyright law, and that was only one college course, though I do try to follow news stories about related issues. I didn't think to write a post on 9/11 here this morning since I don't think about the day in relationship to genealogy, and I have another blog where I post my thoughts on all other topics. I decided to write a few thoughts. First, I refuse to listen to Alan Jackson's song despite Miriam's suggestion. I didn't hear it played today, but I've heard it so much, I don't need to listen to it, and it has always bugged me. I like country music generally, and Alan Jackson has some good songs, but I can't stand the idea of bragging about not knowing the difference between Iraq and Iran. You can tell me the narrator of the song isn't bragging, but he's setting himself up as the 'common man' because he is ignorant of world geography and events, but somehow the fact that he is 'common' and ignorant is supposed to make his opinions more 'real' or 'valid' and that seems like bragging to me about his ignorance. The recent American phenomenon of actually turning knowledge and learning into something 'bad' and ignorance into something 'good' is very disturbing to me. I would much rather elect a politician - for any office - who spoke with intelligence than one who I felt I could sit down and have a beer with. End of Soapbox. I won't bother anyone with any more of my political thoughts about the past six years. 9/11: I remember where I was. I was at work. And being at an investment brokerage there was a television playing the Financial News Network in the hallway all day. And every hour or so I'd get up and spend 10 minutes in the hallway with a group of others and see if any more news had come in. Several discussions on legal and ethical issues lately. As a newcomer to the genealogical community, I don't know how common this is. I have come upon another one that's troubling me. Last night, doing some research on a surname in Texas I came across the Ancestry databases of their birth, death and marriage indexes. Several states have their death indexes online. This can be useful. Missouri even has their death certificates online - up until 1956. But they stop with certificates less than 50 years. They have no index for recent deaths either. The St. Louis Public Library has an index for Post Disptach obituaries that isn't complete, but when it is, will be up-to-present. This doesn't trouble me much, since all the people in the index are deceased. But indexes of births and marriages for people who are still living? The Texas birth index at Ancestry is for 1903-1997. The marriage index is for 1814-1909 and 1966-2002. If I had been born in Texas, I'd be on it, as would my parents, and grandparents. The birth index gives names of both parents, with maiden name for the mother. Combined with the marriage index, this provides an easy reference to track the generations. There is a large gap in the marriage index, but still, while the census stops at 1930, if the family remains in Texas, you can pretty much keep on going until the current generation of parents. And then at several phonebook websites (Or on Google if you figure out the city they live in) you can probably find the phone number of the living generations. And give them a call and say, Hi, I'm a cousin. It certainly might not be advisable to start out the conversation that way. And you might do better trying to find their address and writing a "blind inquiry" letter to them. (Uncle Hiram has some good advice on that.) It's way too easy to hang up a phone. But Texas certainly makes it easy. I'm not sure how many other states do this. Randy at GeneaMusings back in February suggested California was the only other one. Chicago (Cook County) recently announced it is putting a lot of their vitals online - with an estimated date of arrival in January, but I don't know if this will include recent vitals. He also asks for input on the privacy issue. I didn't see his post back then (see first paragraph) but I'm giving it now, I guess. I don't like it. Well, that is, looking at it from the perspective of somebody tracking me down - online - within a couple hours of fairly easy research - if I don't want to be tracked down that easily. I don't have to worry about that, I don't live in Texas. But I do have some Texas relatives. I now know their names. I won't mention the surname. And while I'm not about to pick up the phone, I think I'd be silly not to write a couple letters. Gives them the option of not replying. I might even play 'dumb' and say that I think 'we may' be related. Don't want to scare them by telling them that I *know* we are. Of course, I'd be surprised if this hasn't been discussed in Texas newspapers, and they know full well how easy it is. So they might see right through my facade. I've been having fun with Genealogue's challenges, but I often see them after the answers are revealed in the comments, or while I am at work without much time to solve them. I did submit one to him, and it was fun to see people solve it. A local puzzler named Nobody published a puzzle late last night early this morning, and today it has a genealogy-related slant. I found it not too challenging, but still somewhat fun, since it involved some well-known names, and thought others might like to try their hand. Nobody's site used to be much more active than it is now, but it's good to see they're not completely gone. Not too many people know what a Jenny is. A Jenny is a form of poetry I created last year. (Link is to my other blog). Like haiku, the word is both singular and plural. We all have eight great grandparents. Half of us don’t know them. Deutsch, Lichtman, Van Every, Denyer. I could not wait that long to find them. I find it a lot easier to think in syllables of 5-7-5. Maybe I'm part Japanese; from a past life? without stopping to read them. Since it's Labor Day in the United States, and I believe in Canada too, as opposed to all the other countries that still observe it on its original May day, I've been thinking about the work my ancestors did. In the early 1900s they were tailors, launderers, undertakers, salesmen. The next generation had several lawyers and doctors. Most people see that as a jump, because we focus on the money, and the years of required education. But every one of my ancestors in the first list were self-employed businessmen, dealing with clients in much the same fashion. I've found an online interview of a distant relative who left the city and started a medical practice in a small rural town in the 1930s because they had no other doctor. For years he charged his patients $1, and never sent out bills, because he knew they would pay if they could. Something which he, and his children, and his children's children should rightly be proud of. In the interview he states one of his reasons for becoming a doctor was because his mother didn't want him to become a tailor like everyone else in the family. I cringe at the joke, even though it receives the expected laughter from the interviewer. Mostly because I know the interviewee's father, and his father's father were tailors, and I know his mother's father was a bootmaker. It's not exactly what he said that bothers me, but how he said it. The parents of all his cousins probably had similar (mostly fulfilled) desires for their children. I like to think, though, that instead of looking down on the profession, they saw the hard work that went into it, and the years of poverty, and wanted an easier life for their children. That's probably how he looked at it too, and I'm just reading too much into a one-liner in an interview. I was certainly thrilled to find a recording of his voice. The interview is about 30 minutes long.